This week I was inspired to design my Sew the Row quilt around some pretty pale-blue pieces that were hiding in my stash. The delicate fabrics were perfect for blocks that were understated with simple shapes. 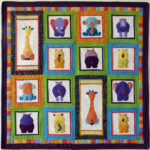 As I was designing, I was thinking about the muddles I got into when I first started making quilts. It wasn’t until I took my first patchwork class that it started to make sense. Now, when I write the instructions for a quilt pattern like Sew the Row, I am mindful that I am writing for someone who may not have made many quilts. More experienced quilters can usually look at a quilt, or a block, and know how to put it together, but, for many new quilters, the construction method isn’t always visible. The secret is to look at the block (or quilt) to see how you can break it down into strips or ‘rows’. Look at the block on the left. Can you see the horizontal rows? For some people the rows are glaringly obvious, but not everyone can see them at first. The right way to sew the block is to join the pieces in rows. 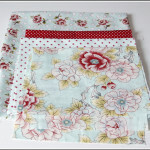 You can then sew the rows together with lovely straight seams. The wrong way to sew the block would have you sewing around corners. Trust me, you don’t want to be doing this. It will drive you nuts and slow you down. This rule also applies to sewing the blocks together and also to adding borders. Next time you look at a quilt, try and see the rows. Sometimes they’re vertical or they could be diagonal, sometimes they’re only in the borders, but, if you can sew the rows whenever possible, your quilting life will be much easier. 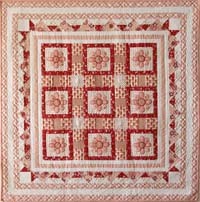 Sew the Row is a free pattern and perfect for those who like to keep things simple with easy squares and rectangles. To encourage more creativity, it’s a Free Pattern for you to download. 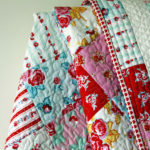 The fabric in this quilt just makes it! Love those roses as I know you do to! Thanks, Sharron. Roses and polka dots were made for each other.